Where the Light Falls by Allison and Owen Pataki (her brother) follows a solider and a lawyer during the tumult of the French Revolution. I was a big fan of Allison’s The Traitor’s Wife, so I was eager to dive into this new story of the French Revolution. I don’t believe Owen has written anything professionally before this book, so I wonder how their writing process was as far as if one person solely wrote one character, or if they switched off per chapter. I wonder about who wrote what bit because, oddly enough, I found the first 50% (that’s a lot!) of the book to be quite slow. In the first half, I didn’t find myself particularly drawn to, or connecting with, the main characters: soldier Andre or lawyer Jean-Luc. I was far more interested in Sophie (Andre’s love interest) and Marie (Jean-Luc’s wife.) Unfortunately, Sophie and Marie seem to merely exist only for the sake of their male counterparts’ plots and character arcs. I may be biased in saying that I think the book would have been far more interesting if it either took place from Sophie and Marie’s POVs, or at least incorporated POV chapters from them in addition to Jean-Luc and Andre’s chapters. I felt like I was missing half the story since a lot of character development with Sophie and Marie happened “off-camera” and we were told about it after the fact. Furthermore, despite the slow pace at which the story finds itself, the dates start to whiz by with major character changes happening across the board also “off-screen”. These narrative choices hold right up until the end as well. I found Sophie and Marie, for the most part, to basically be damsels. And this fact seems very odd to me considering the wealth of female characters in The Traitor’s Wife, as well as those characters’ complexity and dimension. 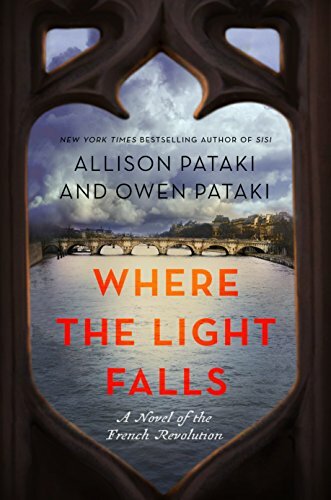 I know Allison Pataki’s other books feature female protagonists as well, so I wonder if the fact that her brother wrote Where the Light Falls with her is the reason why Sophie and Marie fall so short of expectation? It was not just the female characters who seemed one-dimensional, but also the two main adversaries of Jean-Luc and Andre. The motivations of the villains aren’t revealed until quite near the end of the book, making it all very “archetype villain reveals his evil plot in its entirety at the end of the movie!” I would have had their motivations unfolded over time through actions, which, to be fair, is partly how it happened for Jean-Luc’s nemesis to an extent. I do have some positives! I appreciated that both sides of the Revolution were shown, and how the story and characters were painted gray rather than strictly black and white. I find the best “war stories” are those that betray heroes and villains on both sides. I also enjoyed the descriptions of the sheer terror that was happening during this time, specifically with the ruthless beheading of so many people in the name of freedom and peace. I unfortunately found this book to be both underwhelming and disappointing. I don’t like to give negative reviews, but I also want to be honest. I felt as if so much of the story was just missing, and then the end skips ahead a few years and everything is magically okay and we never get to see a very important reunion scene. That example, for instance, is representative of why I think I didn’t really feel connected to any of the characters. I wonder how different this story would have been if Allison Pataki had written it herself?